The possible next Mrs. Blake Shelton is back! Former No Doubt frontwoman and fashionista Gwen Stefani is back in the coaches’ den. It has been three seasons since Team Gwen’s Jeffrey Austin became her first artist to make it to The Voice finale. Now, Gwen is ready to mentor her artists to earn their spot in the finale. But she is not the only female coach who wants finale glory. After making it to the finish line with We McDonald last season, Alicia Keys is back to continue her search to mentor new artists and try to be the second female coach to join the show’s founding mother and Queen of The Voice, Christina Aguilera, in the winning Voice Coaches Hall of Fame. JChosen was the first artist to face the coaches this season! He hoped to impress the coaches with his cover of Marvin Gaye’s “Sexual Healing.” The former athlete turned special education teacher caught the attention of all four coaches with his superb vocal range. His vocals reminded me of both Season Two winner Jermaine Paul and Team CeeLo alum Trevin Hunte. Adam gave him a hug after his performance and stated he would be the dude to win the season, while Blake called out his pitch perfect tone. Meanwhile, Alicia said that Marvin Gaye would be impressed with his performance and stated that it was a blessing to be in his presence. Gwen closed out the coaches’ commentary by saying that JChosen has true talent, loved his heart, and wanted to provide him with both the male and female perspectives in music. JChosen became the first artist to enlist with Team Gwen! While the coaches talked about Gwen and Blake’s relationship, 25-year-old Lauren Duski did not want to join her family of dentists in their profession, and after she had graduated from college, she pursued her dream of becoming a singer. She sang Jewel’s “You Were Meant for Me, ” and her voice gave me chills. I honestly believe that Jewel would be proud of that cover if she watched it on YouTube. Her performance caught the attention of Adam, Gwen, and Blake! Gwen loved that Lauren used all elements of her voice, while Blake stated that she could win this competition. Adam indicated that he believed in her and wanted to guide her to make music that did not have a genre. However, she went with Team Blake. Season 11 alum Johnny Hayes returned to the show for a second chance. He wanted to leave his father’s landscaping business and wanted to pursue music. He caught the attention of both Adam and Gwen with his take on Otis Redding’s “Try A Little Tenderness.” While Gwen and Blake tried to double team against the Maroon 5 front man, Adam loved his version of the song and liked his energy, which convinced him to join his team. Over the past few years, I have noticed that the 15-19 age group has been dominating shows such as American Idol, America’s Got Talent, and The Voice. There have been several standouts such as Laura Bretan and We McDonald, while there have been singers who have been just plain average (I’m looking at you, Braiden Sunshine and Daniel Seavey). One singer that belongs in the former category is Anatalia Villaranda. The 16-year-old steamrolled through Bruno Mars’ “Runaway Baby.” I loved her poise and passion that she showcased on The Voice stage, not to mention her dynamo voice. Little Fantasia caught the attention of all four coaches. Alicia and Blake were watching her family from the sidelines and asked them to join her on stage to congratulate Anatalia. After their victory celebration, her family left the stage so that Anatalia could pick her coach. Alicia called her an unafraid artist, while Gwen loved her energy and wanted to share her experience as an artist with her. Adam added that she had potential raw energy and predicted that she could win this season. However, Anatalia became the first member of Team Alicia this season! 27-year-old Stephanie Rice grew up around music and faced hardships when her parents disowned her due to her sexuality. Stephanie’s fiancé, Jan, inspired her to pursue her dream. Her interpretation of Kelly Clarkson’s “Piece by Piece” moved me tears. Each word broke my heart and caught the attention of the two lovebirds. 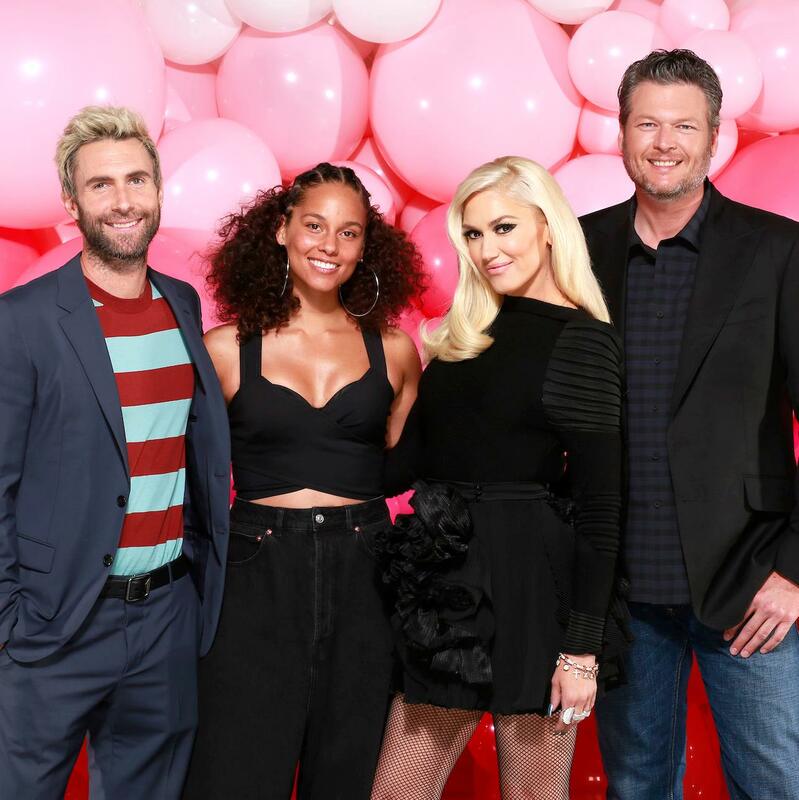 Gwen was moved by her performance and stated that she is on The Voice to work with her. Stephanie picked Gwen as her coach! As the coaches made fun Blake’s Oklahoma ways, 19-year-old Mark Isaiah made his way to the stage. Mark sang Shawn Mendes’ “Mercy” for his Blind Audition, and I think that Shawn would be impressed with his cover. His performance caught the attention of both Adam and Gwen, and they already started fighting. Gwen was shocked that Mark had not been signed yet and that he sounded like he belonged on the radio, while Adam stated that he belonged to the pop world. While Blake and his family wanted Mark to pick Gwen, Mark went with Adam. 14-year-old Brennley Brown was one of the season’s youngest competitors this year. She fell in love with the music when she was six-years-old and wanted to be a performer ever since. Last year, The Voice lowered the age for people to audition from 15-years-old to 13-year-old. I wished that they had a Voice Kids edition for artists like Brennley because she is not ready to play with the big boys. However, her cover of “Stupid Boy” caught the attention of both Alicia and Blake. While Blake bonded with Brennley over their mutual love of country music and she instantly became the youngest member in Team Blake history. The final artist of night one was registered nurse Felicia Temple! Felicia had music in her blood as her father was a part of the Sugar Hill Gang and she was able to do shows with BET and perform at Madison Square Garden. However, she put that aside to battle a rare form of cancer. Now cancer-free Felicia auditioned to keep her music career alive. Felicia shined when she sang Etta James’ classic “All I Could Do Was Cry.” Her omnipotent voice caught the attention of Alicia, Blake, and Gwen! Felicia also revealed that she was nicknamed “Felicia Keys” in school because she performed the “If I Ain’t Got You” singer’s songs during talent shows. Felicia’s day got infinitely better when she and Alicia sang “Fallin’, ” and it gave me chills! She became the latest member of Team Alicia! Tomorrow night, “The Voice: Season 12” Blind Auditions continue!